This is a partnered post with CK Mondavi and Family. All opinions are 100% mine. Search #PairnPost on Instagram and Twitter for more recipes and wine inspiration! 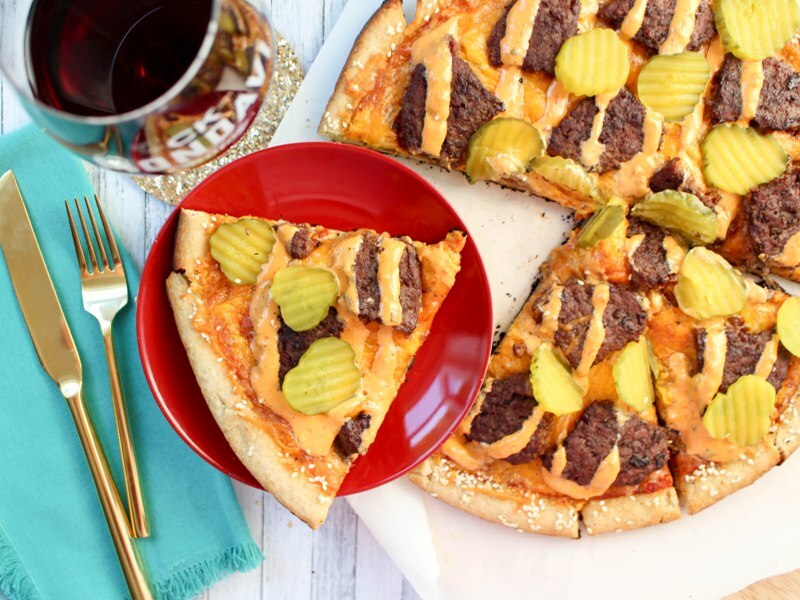 Pixar Fest at Disneyland is wrapping up soon, and the surprise hit of the summer for me was their special cheeseburger pizza available at Pizza Port (Pizza Planet) in Tomorrowland! When I first saw pictures of this I thought there was no way it could taste good. There was just TOO much going on! I was so surprised when my friend, who was there on opening day, RAVED about it and told me I had to try it right away. I was skeptical but she was right … there’s something magical about this comfort food mash up. I wondered if I could recreate it at home, since I can’t bear the thought of this delicious dish leaving me forever. 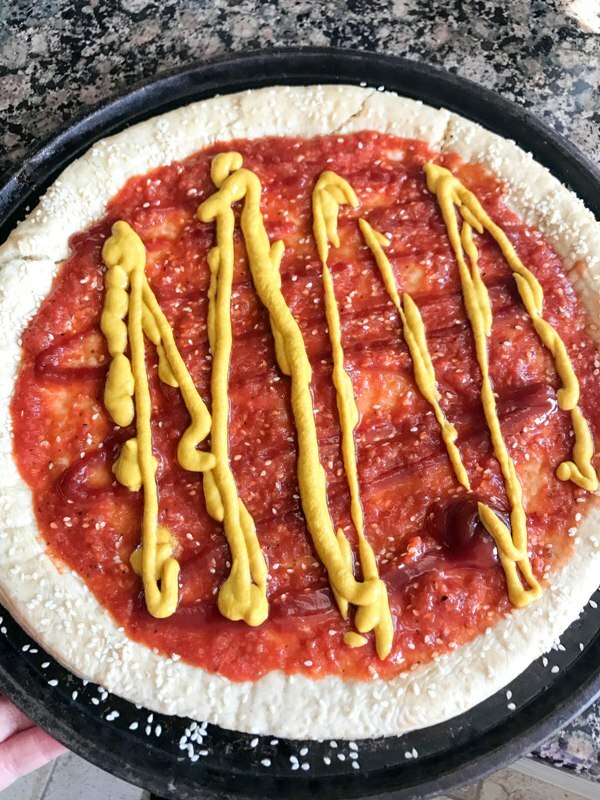 It does take a number of ingredients but I made my life easier by purchasing a pre-made pizza crust and canned pizza sauce. With these two short-cuts, honestly, putting this pizza together was a breeze. I handled the assembly and my husband manned the grill. We both agreed this is a new summer dinner favorite. 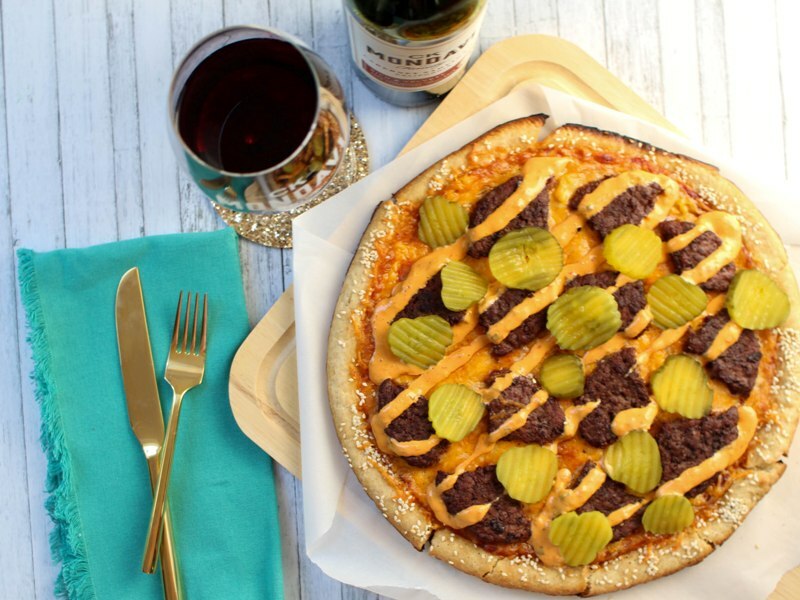 One thing you CAN’T do at Disneyland is pair your cheeseburger pizza with a nice glass of wine. 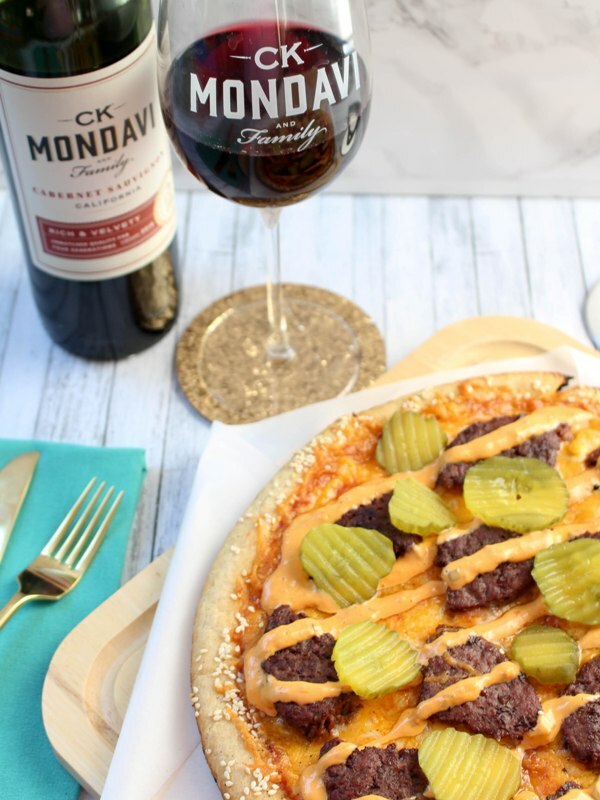 I paired this meal with a nice glass of Cabernet Sauvignon by CK Mondavi and Family, which is my favorite red wine but also happens to pair well with cheeseburgers! Meet the CK Mondavi and Family Winemaker from CK Mondavi and Family on Vimeo. 1. If you’re using a pizza stone, pre-heat it on the grill. Place the pizza stone on the grill and let the grill get up to 400-500 degrees (500-600 degrees if you’re using uncooked pizza dough). This could take 30-60 minutes. 2. 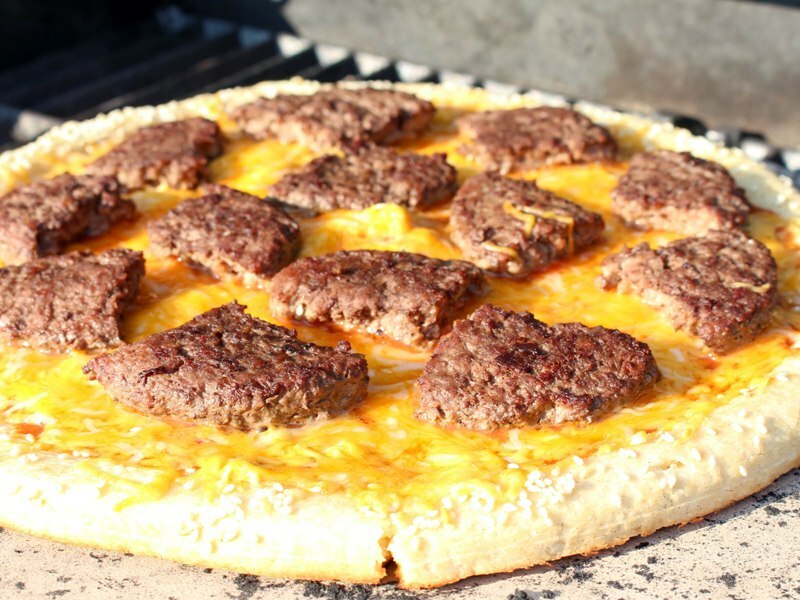 Pre-cook the hamburger patties on the grill or a skillet. Be careful not to overcook them; they will get a little extra cooking time on the pizza. 3. While the patties cook, start to prepare your pizza. Lightly coat the pizza crust with olive oil. Sprinkle sesame seeds on the crust. Add a thin layer of sauce, topped with ketchup and mustard. Take a look at my picture for an idea of how much to add. I will say that once I was eating the finished product I felt like there was too much ketchup and mustard; however, my husband liked it. 4. Top the pizza with shredded cheese, as much as you want. 5. Once the hamburger patties are done cooking and have cooled a bit, slice them into fourths and arrange on top of the cheese. 7. Remove the pizza from the grill and transfer to a sheet pan or cutting board. Allow to cool a bit (5 minutes or so). Add the Thousand Island dressing and pickles. Slice and serve! 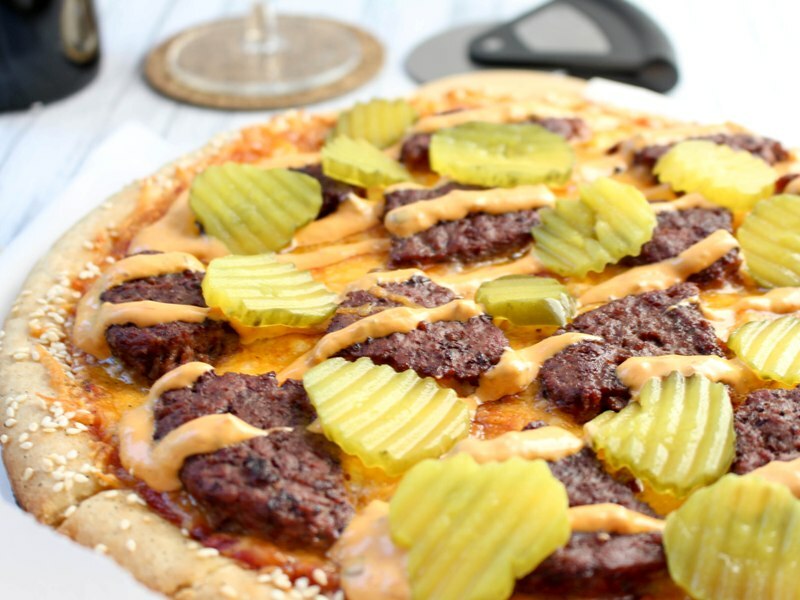 It doesn’t taste exactly like Disneyland’s cheeseburger pizza but I got pretty close! It’s a hearty meal and perfect for a summer BBQ. Let me know if you try it! If you like this recipe, please Pin it!